We went to the last day of the Al Ain Air Show and took some photos that we thought you might enjoy. There weren't any really old airplanes that we could see, but there were some cool planes and some of those sheiks drove in really cool cars. 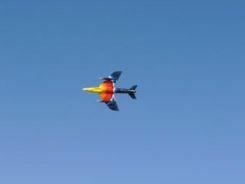 The Hawker Hunter that flew there was the most beautifully painted airplane that I have ever seen. The Saudi Hawks, the Royal Saudi Air Force Aerobatic Team were there. The planes were painted beautifully, actually looking like the markings on a hawk in flight. Jacquie Warda, an American lady aerobatic pilot, did quite well in the competition. Maybe you guys already know about her. This probably isn't my favorite airshow, but it's about the only one we can go to as long as we're living and working in Dubai! It was a nice weekend outing. Wish you guys could have joined us. You're the first to tell us about an airshow, and it's an exotic one at that! Can't get too much farther away than Al Ain. Wish we could have been there with you. I'll put up a page with some more of your photos. Thanks for sharing them. Join in and write your own page! It's easy to do. How? Simply click here to return to YOUR Favorite Air Show.